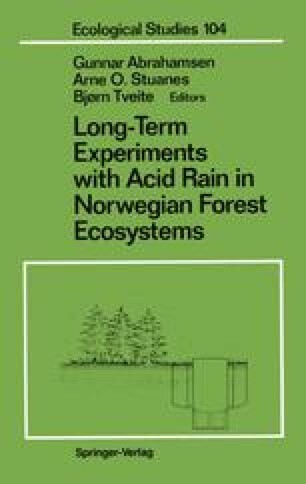 Plant-soil interactions have been examined in the two experiments in which the most pronounced effects on tree growth were found: experiments A-2 and B-1. Simple correlation coefficients were calculated for the relationship between nutrients and A1 in the current-year needles (dependent variable), and soil pH, the concentrations of exchangeable Ca, Mg, Mn, K, and extractable SO4 ions in the soil (independent variables) (see Table 10.1 for experiment A-2, and Table 10.2 for experiment B-1). The analyses were not carried out for the previous-year needles.